Last Saturday my sister Rhonda and I headed out to explore a new Antique and Flea Market. I spotted it on 65 Highway in Southwest Missouri on one of my trips to visit the college in Springfield MO where William will attend this fall. One of the places was called Back Road Relics Flea Market. It turned out to be a very nice place to shop. Rhonda got a few things that I failed to take a picture of. She got a Longaberger Corn Basket for $20. It was in rough shape but still usable. Someone evidently put something very heavy in it as the inverted bottom was no longer inverted. It is now flat. She also got an vintage end table she's going to re purpose, a beveled mirror that's been painted turquoise an she's going to repaint black, and another round coffee table with some neat carved legs that's also painted turquoise and yes, she's painting that black too. I bought this Pyrex Aqua cake pan for my new kitchen (you know the one I'm going to have someday). I only paid $4.95 for it. When I got home I did a little research on it and it seems I did quit well on this one. There is one just like it selling on eBay right now and the current bid is $75.00! SCORE!!! 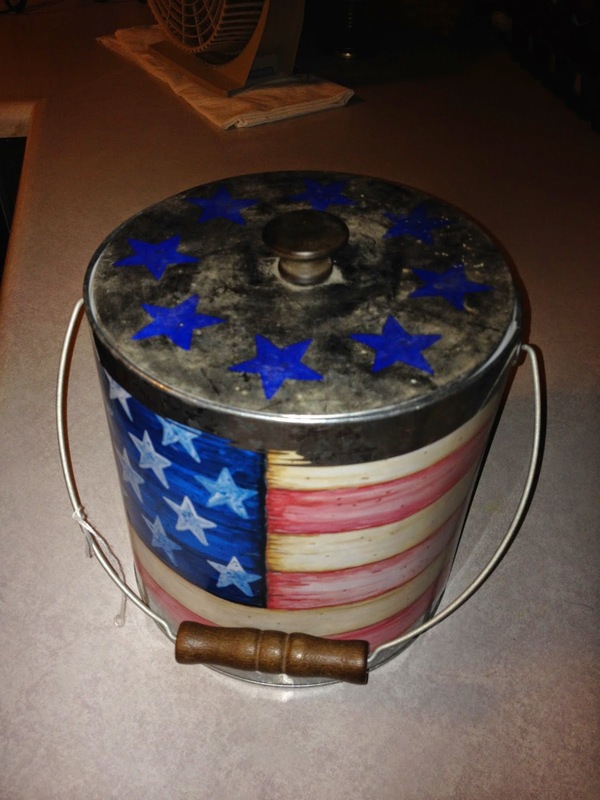 Then I picked up this Americana Ice Bucket. It matches 3 other pieces I already have. I have the oval serving tray, the silverware caddy, and the drink tub. I only gave $2 for it. Much less than what I paid for the others some 10+ years ago. 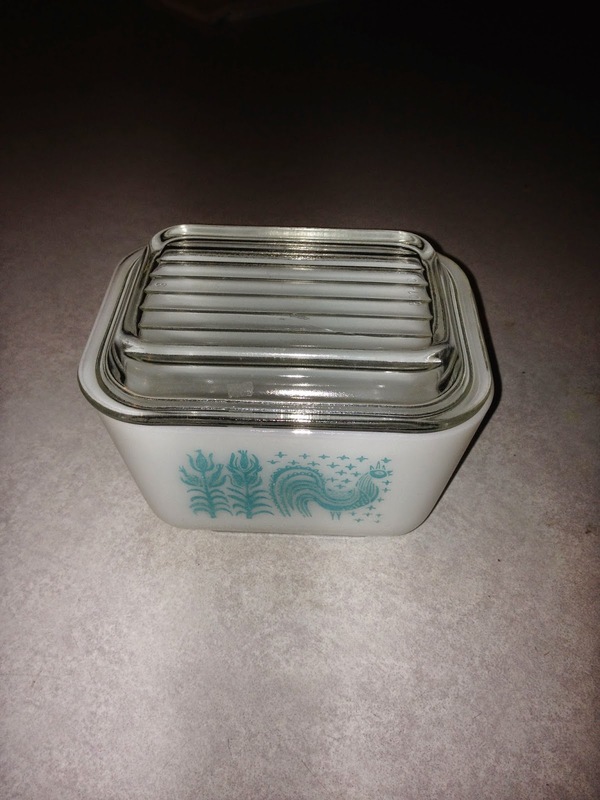 This cute little Pyrex Dish is for the "new kitchen" also. I paid quite a bit more than $4.95 for it though. I really wanted the other 3 dishes the same size as this one and the large one to match but my pockets weren't that deep. 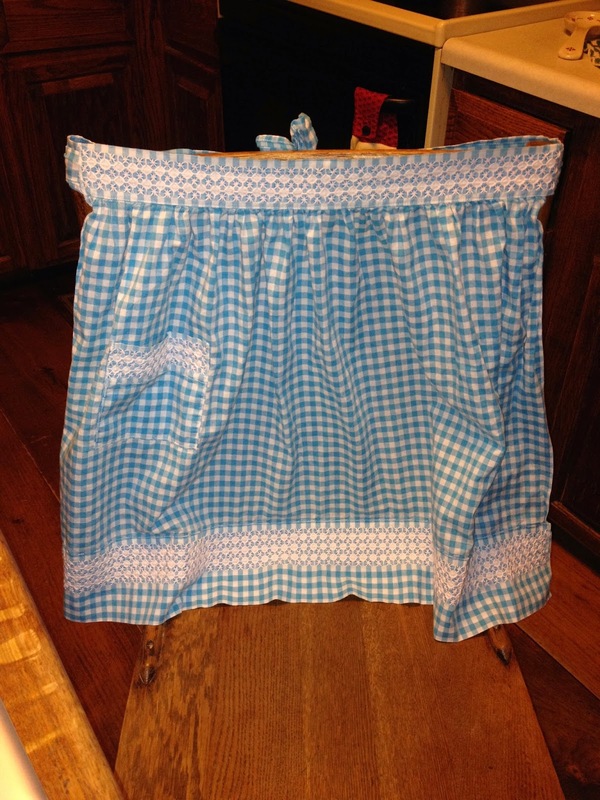 The color in the picture of this apron looks blue but it's really aqua.... to go in my "new kitchen". And look at the detail. 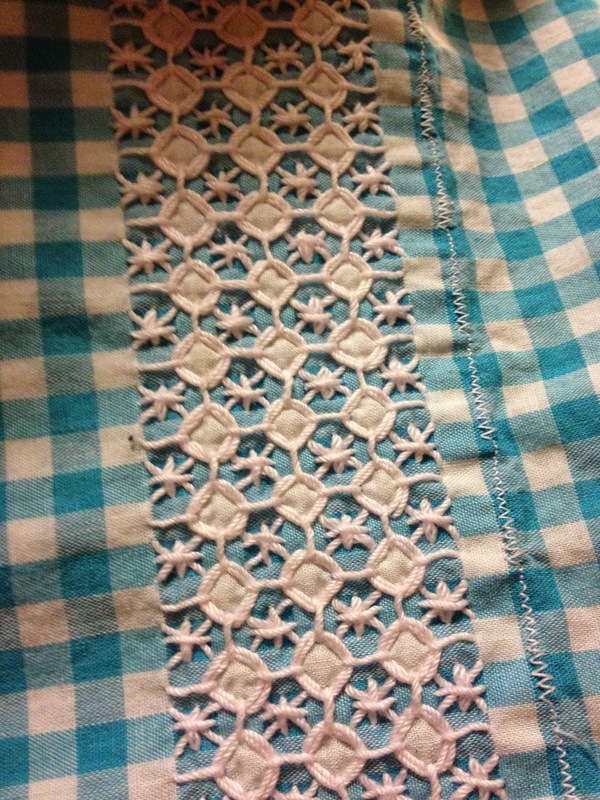 That's not lace, that handwork, chicken scratch. And you can see the color better in this picture. And one more thing for my "new kitchen". The plan is for it to be red and aqua. 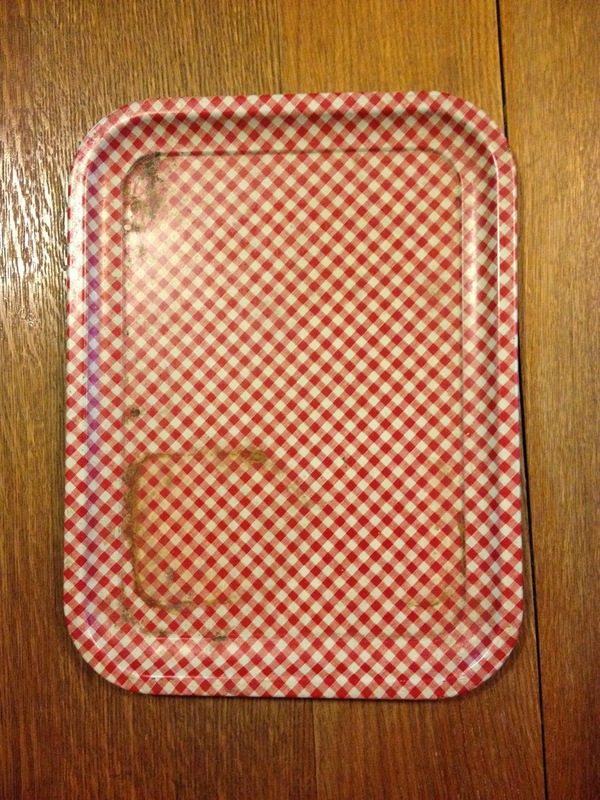 This cute little vintage gingham tray was only $2. I don't think I can get the rust off without taking the paint off but I still think it will look cute in the kitchen. Who knows I may not even use it at all but that's okay since it was only $2. I resisted several other things as I figured I'd better not push my luck. The King isn't the "junk lover" that I am and hates it when I truck all these things home to Texas. I can hide a few small things. It's those big pieces that get me in trouble. What great finds! I grew up with items like those dishes! I love the idea of the red and aqua kitchen! Great finds!!! Love that color combo...so fresh and retro!!! Super finds...love, love, love that apron! Looks like you had yourself a fun time! You might try rust remover in brown plastic bottle. Not sure if it would hurt the finish. I would use it sparingly.